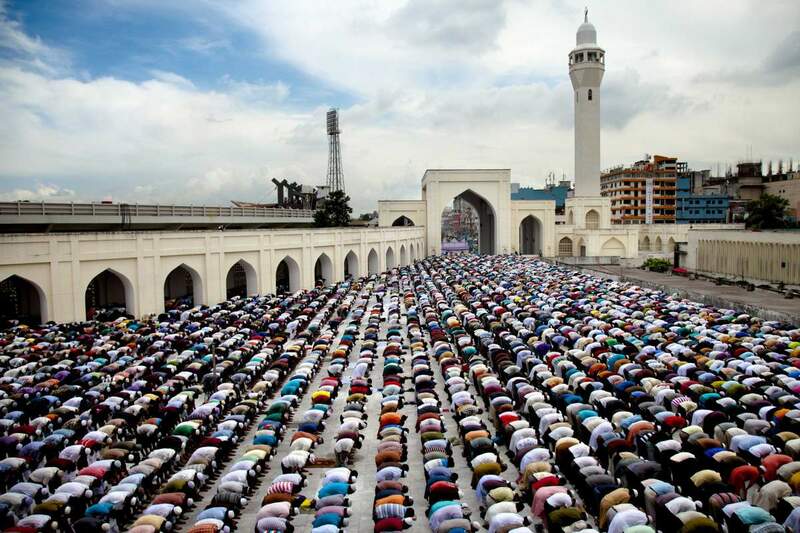 JNN 05 Apr 2015 New York : The World’s Muslim population is growing so rapidly that by 2050, the number of Muslims will be nearly equal to the number of Christians across the planet—possibly for the first time in history. The new forecast is part of a sweeping religious-population study released Thursday by the nonpartisan Pew Research Center that projects significant demographic shifts across the global religious landscape. Most major religions—including Christianity—will see their numbers increase. But the exceptional growth of Islam, as well as the rise of those unaffiliated with any religion, is poised to alter historic religious balances across Europe, the U.S. and Africa over the next four decades, the study suggests. By 2050, the study says, there will be more Muslims than Jews in the U.S.—though both groups will remain small minorities. Researchers note that their count only includes those who identify as Jewish by religion, not those who may consider themselves culturally Jewish but decline to claim it as a religion. The U.S. will remain a majority Christian nation, though the number of people identifying themselves as Christian is expected to decline from more than three-quarters of the population to two-thirds, the study says. The number of Christians in Europe is expected to decrease by about 100 million people to 454 million. Christians will remain a large or even the largest group in countries including France, the U.K. and Australia, but they will no longer make up the majority. Many European countries will experience a rise in the number of people unaffiliated with any religion, as well as nearly a doubling of the Muslim share of Europe’s population—to 10% from 5.9%. The study, based primarily on census and survey data, takes into account the effects of migration, conversion and the ages of religious populations, but “fertility is the single most important factor driving outcomes,” said Conrad Hackett, the study’s demographer. Muslims have an average of 3.1 children per woman—the highest rate of all religious groups, he said. Christians are second, with 2.7 children per woman. Hindus have 2.4 children per woman, and Jews have an average of 2.3 children per woman. The projections come as Europe struggles to assimilate its burgeoning Muslim minorities, amid tensions spurred by economic forces and the rise of the terrorist group known as Islamic State. It also comes as Americans battle over the claims of religious believers who say their rights need protection as society becomes more accepting of gay rights, and as more people in the U.S. turn away from religion. By 2050, Muslims will make up 30% of the global population, with 2.8 billion adherents, while Christians will comprise 31%, with 2.9 billion followers. The only other time in history the population figures may have been as close to parity is between the years 1000 and 1600, as Islam expanded and deadly plagues ravaged Christian populations in Europe, according to scholars cited in the study. If population trends continue, Muslims could outnumber Christians by 2100, the study says. Researchers said that although the Muslim population is expected to increase by more than 70% by 2050, Muslims will still be in the minority in Western Europe and the U.S. Although India will remain a Hindu majority nation, they said, it will also be the country with the largest number of Muslims. By comparison, Christianity is expected to see an increase of 35% over the same period, enough to hold its current share of the global population as it grows to a projected 9.3 billion from 6.8 billion. This entry was posted in AFRICA, America, Asia Pacific, Europe, Iran News, Iraq News, Middle East, Pakistan News, United States and tagged Christian, Christians, global population, muslim population, Muslim Population by 2050, World population. Bookmark the permalink.